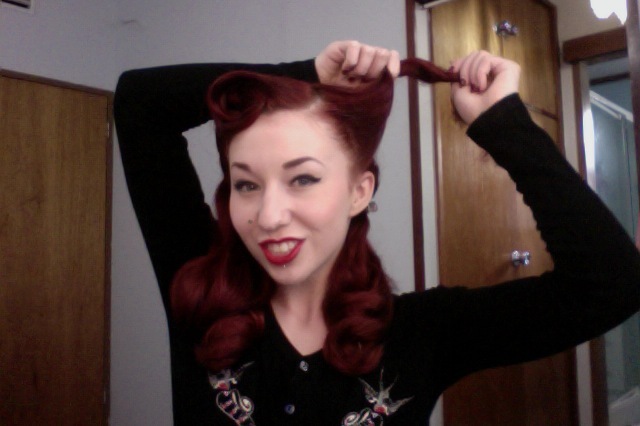 Quick & Easier Victory Roll Tutorial! Today I’m posting this blog about one the most popular requests for vintage styling tutorials that I receive, how to do a victory roll! I first discovered victory rolls when I was about 14 years old, before I’d made the discovery of what pinup actually was, I was experiment with hair curlers, and thought to myself “gee, wouldn’t it be cool if you could style your hair like this, but not have the curler there?”, I also didn’t know YouTube was a fantastic source for different tutorials so I just continued to experiment till I developed my own unique way of styling victory rolls. 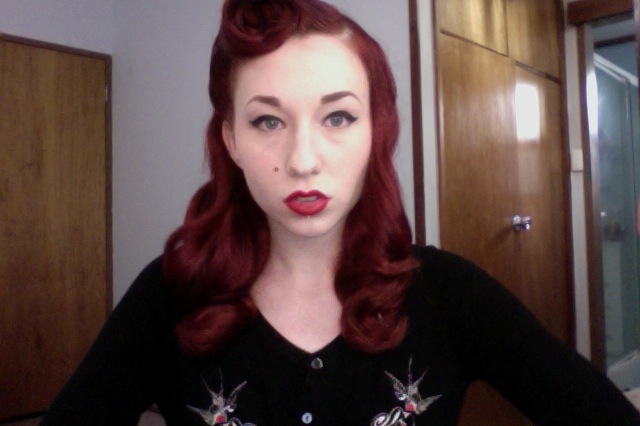 Almost 7 years later I’ve become quite a victory roll veteran, and love experimenting with new ways of styling with this basic method. 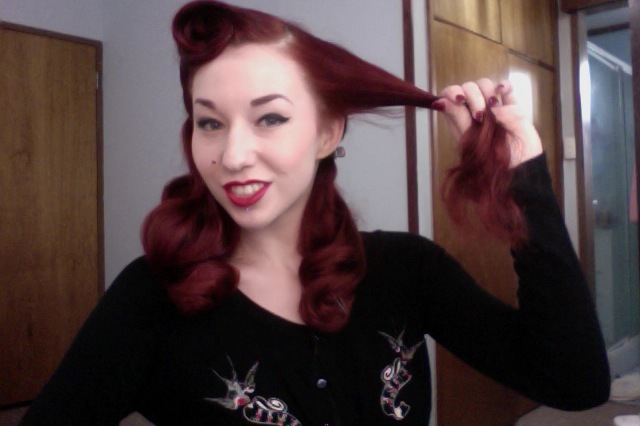 I find my method to be most effective on thicker/longer hair styles, but also for people who are new to vintage styling, as its a little less easier to learn and there is less room for error. 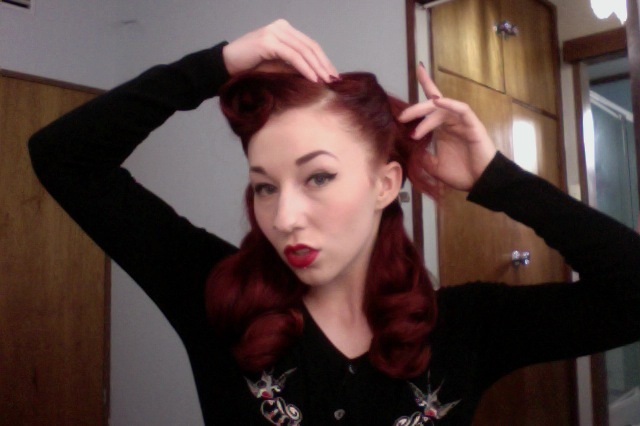 In saying this unless your a wizard with hair, it will take quite a lot of practise before you reach pinup perfection. You’ll want to divide your hair into sections, sectioning off your victory rolls from the rest of your hair, and pinning these out of the way so you can curl your hair, or style it however your please. 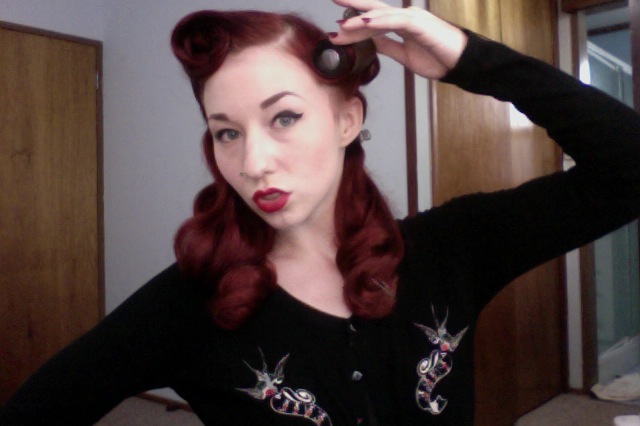 Setting victory roll with hot roller. Hair once hair roller is removed. If you have finer hair you may need to backcomb this section to create more volume, I naturally have quite thick hair and don’t back-comb. Continue on to brush this section up on a 45-degree angle, using hairspray as you do this to keep any lose hairs from straying. 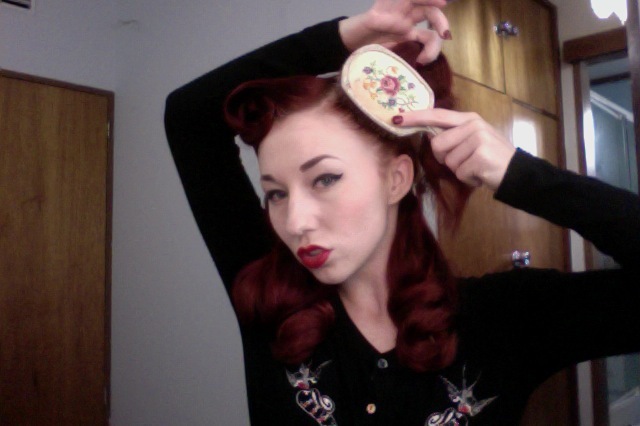 Brushing hair up in a 45-degree angle. Lightly spray the entire length of the hair, from roughly the half way mark of you want to hold and then twist the hair behind itself creating an “o” shape (reference photos before). You can play with placement of the “o” shape, to create your desired look (a more full victory roll or a flat victory roll), from here you’ll want to use 2-3 hairpins pinning the “o” shape into place. Holding hair at the half way mark. Twisting hair behind itself creating the “o” shape. Like in the photo above and below you can see there is the ends of your hair sticking out behind the victory roll, you can just fold/roll this up and pin it inside the back of the roll, this if not pinned flat, can be used to make your victory roll fuller. Hair remaining out the back of the roll. Finish this by spraying the roll lightly with hairspray and using your hand to lightly smooth out any loose hair. Ta-da! 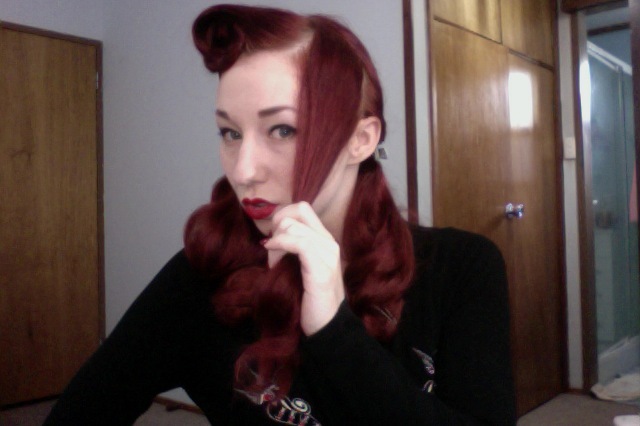 You now have a beautiful victory roll! 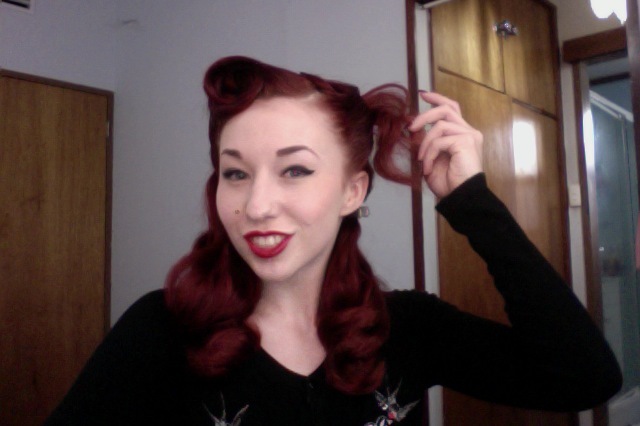 Hopefully this photo tutorial has helped you on your pinup journey. If you have invested some time practising this method and its still not working for you, you may wish to check out some other methods that can be found on YouTube. 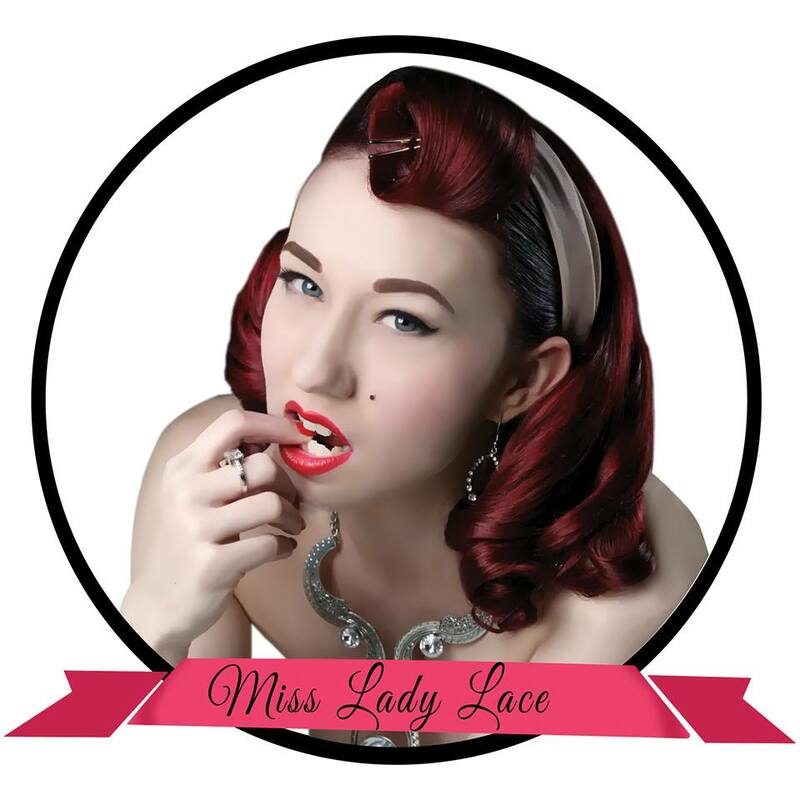 If you have any questions in regards to this feel free to comment or email me at missladylace@hotmail.com. 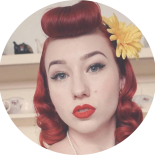 I also run my Pinup Bootcamp class which is a six-week course specialising in the art of pinup modelling where I further explore vintage styling and so much more! For more information and booking details click here! PS. This weekend Pretty Dress Clothing should also have a couple VIDEO tutorials that we’ve been working on for quite some time available on Youtube! I’ll post up as soon as this has been done so! 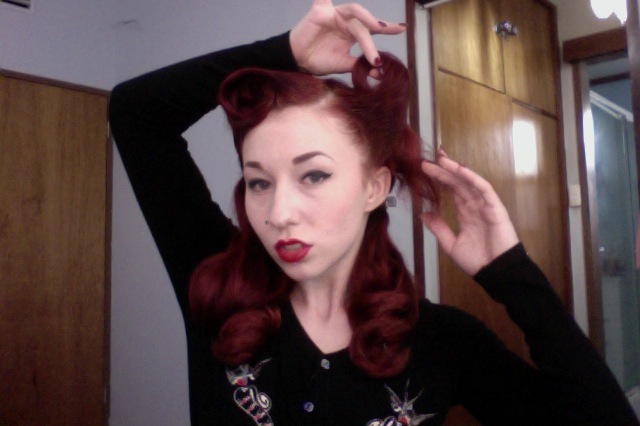 This entry was posted on May 1, 2013 by Miss Lady Lace in Fashion, Hair & Beauty, How To...., Pinup and tagged 1940's, 1950's, 40s, 50s, burlesque, burlesque hair, hair tutorial, how to do a victory roll, how to do burlesque hair, how to do pinup hair, how to do vintage hair, how to pinup hair, Lady Lace, miss lady lace, old school, pin up, pinup, pinup hair, retro, retro hair, retro styling, styling, victory roll, vintage hair, vintage styling.